Soca Valley Slovenia: 7 Things That Should Be On Your To Do List! 2 How to get to Soca Valley? 3 Where to stay at Soca Valley? 4 What’s the best way to see Slovenia? 5 How much does Slovenia cost? I’m sitting at the airport in Slovenia and waiting for my flight out of this magnificent country and the Soca Valley. Over the last few days I got to experience what I think is one of the best adventure destinations in Europe: The Soca Valley in Slovenia! I came here to attend the Soca Outdoor Festival, an outdoor festival that took place for the second time this year in the Soca Valley in the tows of Tolmin and Kobarid. Two really small towns that are right in the epicenter of awesomeness. Awesomeness, because in my opinion this is one of the prime destinations for adventure travels in Europe. There are so many things to do, that just picking 7 things is a little difficult but here are some of the highlight you can do in this incredible area. I didn’t manage to do this because my flight was delayed on my way into the country but I’ve seen others do it and talked to people that went to Slovenia for White Water Rafting and the sparkle in their eyes when telling their stories of the wild waters of the emerald blue Soca River convinced me that this must be an awesome experience here in Slovenia and that I have to come back for more! The waters of the rivers here are just incredible. I’ve only seen this on paradise like island in the Southern Sea. The waters of this river are throughout the country emerald blue! What’s better than seeing all these canyons than hiking? Zip Lining over them! I did zip lining with a company in Bovec called Soca Rafting, that runs tours in the outskirts of the town and it was pretty cool. With over 40 km/h you rush over the canyons and between you and the river just lays a lot of air and a 50 to 60 meters drop! Pretty scary and awesome at the same time! The tour, depending on the size of the people takes about one to two hours and the guides speak several languages! Beginners, Intermediate or Hiking-Pros will love the Soca Valley. The views that you get at the end of each hike, no matter how difficult or easy it is, are just phenomenal! You will find hikes that are extremely easy and only go an hour up to day long hikes that will take you to the boundaries of your comfort zone but all have beautiful sights and views in common! 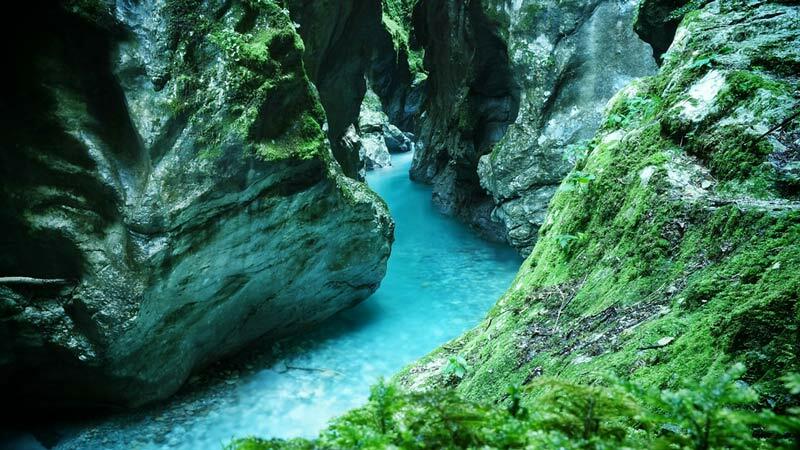 The Tolminka Gorge is a must do when visiting the Soca Valley. Fee is 4 € per Person and 20 % Discount for Students! We visited the lowest point of the Soca Valley the Tolminka Gorge, which is a an easy hour long hike in the neighborhood of Tolmin, a stunning gorge with incredible colors. We also hiked to a nearby waterfall, called Slap Kozjak, it was a very easy hike and also just took about an hour. On really hot days you could just take a break and have a swim in the beautiful rivers of the valley and take a picknick with you! 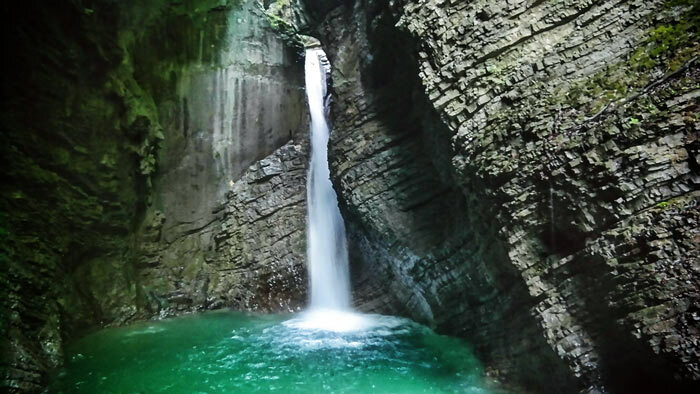 Slap Kozjak outside of Koberid is only a short hour long hike away from a nearby parking place! During the Soca Outdoor Festival there was a paragliding competition. Hundreds of Paragliders jumped off a mountain to make it first to the valley. Pretty impressive! I’ve seen videos of them arriving at the ground with an incredible speed! It’s even cooler, when you watch it from one of the surrounding mountains when they make their way down to the valley! I think that every second Slovenien in this region owns a mountain bike, I’ve seen so many locals and foreigners biking around the hills around Tolmin and Kobarid, that it seems that it’s a great location to do this! I watched the finals of the Soca Outdoor Festival Mountainbike competition and those guys are some serious pros! Absolutely amazing to see how they dominate their bikes! I’m trying Boulder for the first time! As I previously mentioned, the Soca Valley is a serious paradise for adventurers of all kinds. No matter if you really enjoy to be active on your holidays or you are an adrenaline junkie that needs his outdoor fix every now and then. Everybody will be happy in this valley in Western Slovenia! How to get to Soca Valley? To get to Soca Valley there are a few options. The only airport in Slovenia would be the airport in Ljubljana, which is about two hours away from Tolmin and you have to drive over a mountain range. The easiest option, would be to either fly to Venice or Trieste. Venice is about 130 kilometers away from Soca Valley and Trieste is about one hour away. Many airlines connect you directly to Venice including British Airways, AirFrance, EasyJet, Vueling, KLM, Lufthansa and many more. Book your cheapest flights directly through Skyscanner or Momondo or directly via the airlines! From Trieste you can fly with Lufthansa to and from Munich and Ryanair to and from London, Paris, Trapani, Bari, Birmingham, Brussels, Valencia and Alghero. You can book your Ryanair flight via Skyscanner! Both airports have excellent connections to other cities in Europe. Ljubljana unfortunately isn’t so well connected and is mainly used by business travelers, which makes airline prices very expensive. In my case, I had to fly from Ljubljana to Istanbul and from Istanbul to Berlin in order to leave Slovenia. Something I didn’t think before booking the flights! Where to stay at Soca Valley? I stayed at the Ohrideja Apartments, the rooms are ok and the prices affordable. I also visited Pri Kafolu, an organic farm a little outside of town. The Farm is located perfectly on a little hill overlooking the valley. The owner Tomaz runs this place with his family and they grow everything themselves. The food is absolutely delicious, the rooms look good and the view over the valley, especially during sunset is phenomenal! View from the terrace of Pri Kafolu with homemade apple juice! What’s the best way to see Slovenia? If you decide to only travel around Slovenia, I would recommend to fly into Ljubljana and explore the east first before exploring the west and ending your trip back with a day or two exploring the capital! How much does Slovenia cost? Prices are actually comparable like any other european country. There isn’t a big difference. When it comes to grocery shopping there is almost no difference compared to other countries. What definitely is cheaper than at other countries are the activities and lodging. You can get some really good bed and breakfasts from 15 to 20 € per Person. I will soon post a Budget Report for Slovenia! Sign up to the School Of Travel and you’ll be the first to know! Disclaimer: I’m a proud blogger of the Must Love Fesitvals campaign and was in Slovenia to cover the Soca Outdoor Festival! looking forward to my visit in the fall!